Brian Solis from FutureWorks PR and and Todd Defren from Shift Communications have collaborated on a post called: " The Future of the Social Media Release is in Your Hands." They have both been strong supporters of my call for a different type of press release described in my post "Die! Press Release! Die! Die! Die!" Mr Defren quickly came up with a template for my ideas. And over time, it began to be called a "social media release." I have welcomed such efforts simply because it can make my life easier in assembling the information and materials I need when I'm writing stories. The whole point of my rant about the press release was that it was not suitable for use in today's online world. 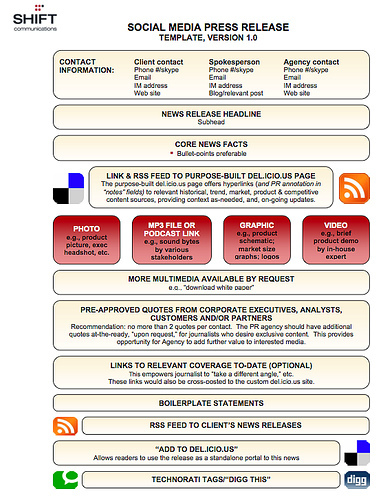 Put some links in it, (still, very few press releases have links), tab/label various sections so I can quickly find relevant information; give me links to relevant stories; give me a page of analyst quotes and customer quotes; provide me with links to stock price; provide links to other media formats such as podcasts and vidcasts. It is all very obvious stuff, imho. Also, I prefer the term new media release, it is a more neutral term than "social media release." But there is a much bigger and more worrying difference than just the name. The social media release is evolving into something much different - it seeks to bypass journalists altogether. ...search engines are an incredible catalyst for news distribution: people are finding news through Google and Yahoo and as a result have become more accepting of press releases as legitimate information resources, on a par with trusted trade journals (this has been documented by several analysts tracking the media space). Their argument appears to be that a social media release is a good thing because readers will attribute the same trust to a social media release as to content written by trade journalists. Self-serving content will appear as if it were unbiased content. Why is this a good thing? It is clearly not. Journalists are accorded a certain level of trust by readers because of their independence. Press releases are accorded a lower level of trust because they come from self-interested parties. Social media releases (SMRs) are taking advantage of readers mistaken perception that Google and Yahoo News carries content created by journalists. Mr Solis and Mr Defren complain that not all search engines discover social media releases. Technorati is one of those problematic search engines. Which I would say is a good thing, that the Technorati algorithm, unlike Google and Yahoo's, recognizes the difference in the content between self-serving corporate releases and the posts of bloggers and journalists. The key to the SMR’s long-term success will be the ability to truly be social; to not only deliver the news in a snazzy new format, but also to facilitate discovery through Social Media channels, encourage sharing and spark conversations, all in a way that brings customers, journalists, bloggers, and analysts together around your story and your community. How you develop and issue SMRs is ultimately up to you, and given that these are the early days, the interest level is high in making sure we get this right. We’re all in this together. My advice is don't. I am a huge fan of the work of Mr Solis and Mr Defren. But on this issue of making social media releases that can find even wider distribution to readers by using various tricks and techniques I part company. Our society needs high quality information and it is the job of journalists to sort through many sources and try to come up with something that reflects a truth. Companies and their PR firms create self-serving materials. And if those materials, under the disguise of social media releases, fool readers into thinking these are the same as if written by journalists-- it does not make the world a better place. Similarly, if those self-serving materials find wider distribution than news stories written by journalists because of sophisticated tricks and techniques--it does not make the world a better place. Let's go back to the concept of a new media release: the release of relevant content in formats that make the job of a journalist easier. Readers can still discover the original materials that the journalists use to write their stories and thus companies will still be able to present their side of the story. Tom, well said, and honestly, I think we all agree here. Perhaps we weren't clear enough in our post and for that, we will have to update it. This isn't a call to action for people to take garbage to new levels of distribution and reach. It all starts with thinking about what you want to say and figure out why it's important to those you want to reach. A crappy press release is still a crappy press release regardless of multimedia or social bling. Our intention is the furthest thing from offering tips and tricks to manipulate people. Writing the news in a way that's helpful, informative, and relative is a critical starting point for any release to be successful now and in the future. The reason for this post is to remind people that tricking out press releases for the sake of tapping into a trend doesn't do anyone any good. Press releases, for better or worse, ARE already showing up in search engines as a natural part of the wire distribution process. It's just a "benefit" for the $1,000 fee you pay. According to Outsell, Inc. over 51% of IT professionals are reporting that they get their news from press releases in Yahoo and Google news over trade journals. It's a fact that is changing the game for PR, and it's not only being driven by journalists, but customers too. What it really represents is an opportunity, dictated by necessity, to do things better. As we talked about last week, PR won't change until it has to. Our post simply explains the differences between multimedia and social media versus the packages that you, as pr pros, are buying and what/where it gets you. Tom, there are vendors now that are selling social media release packages that aren't full social. So, we're calling attention to the building blocks and the channels to help people understand the entire game and to guide them how to tell a better story without adjectives. As you say, "...the release of relevant content in formats that make the job of a journalist easier. Readers can still discover the original materials that the journalists use to write their stories and thus companies will still be able to present their side of the story." This is a call to action for PR people to stop and think about the entire process and take the challenge for improvement, whether multimedia or social. What we all agree on is that we have a responsibility to you and to our customers that we need to finally take seriously. And, in order to build/continue relationships, we have to provide information in way that works for the different groups of people that want info, without the usual b.s. or spintastic hype. Thanks Brian I certainly agree with you on these issues and I'm glad we can both point to the dangers in moving the social press release beyond its charter. There are many people in the PR industry that love the fact that they can capitalize on flaws in the search engines to move corporate messages into the mainstream.